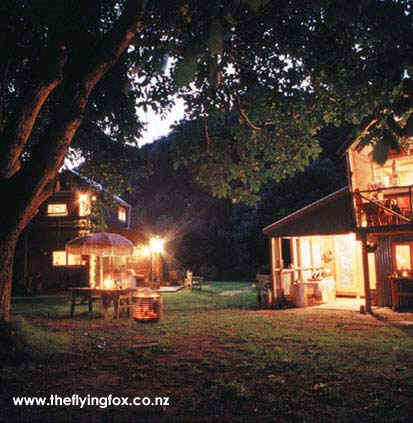 property description: At the Flying Fox we have two small self contained guest cottages set amidst our organic gardens and orchards overlooking the scenic Whanganui River in New Zealand's North Island. Built lovingly from recycled materials, each cottage is fully furnished with an upstairs and a second downstairs bedroom, a lounge and kitchen, and bathroom area. At The Flying Fox we encourage you to enjoy the best things in life - healthy food, our country's natural environment, and to celebrate our history and culture. We aim to minimise our impact on our surroundings, and our guest facilities reflect these aims. 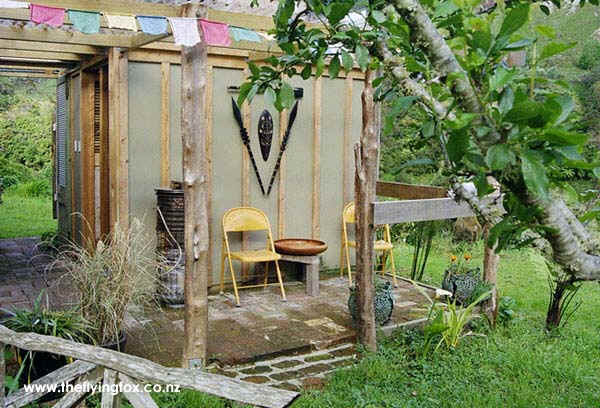 Woodstoves, solar and gas hot water, waterless loos are a feature. Our environmentally friendly principles do not mean guests have to forgo any creature comforts, the cottages have wood fires, and thermostatically controlled heaters, electricity, and although there is no cell-phone reception in our valley, [most would say that’s a major bonus!] there is a telephone and internet connection available at our house. We also have a small hand built gypsy style caravan perfectly suited for romantic overnight stays, or a secluded camping area surrounded by tree ferns. Our accommodation is available on a self catering basis or we can provide you with meal options if you prefer. Our two cottages, ‘The Brew-house ‘and ‘The James K’, are fully furnished, each has its own facilities, kitchen area with gas hobs for cooking ,a fridge freezer, and a lounge area, with music , books and games provided. Both have an upstairs bedroom with queen-size bed, and overlook the river. Bed linen and towels are supplied, as are tea, coffee, milk etc. We also have a smaller hand built cabin on wheels and a private camping area available. If you prefer to have us cater for you, we prepare meals using old-fashioned ‘slow food’ methods [that is no pre-prepared or prepacked products], and use organic, and in-season ingredients as much as possible. Meals are delivered to your accommodation at the time of your choice, or for larger groups we can serve dinner on our covered deck. DINNER [three courses] individually served $40 per person, alternatively, a two course option is available for $30 per person. We cook healthy balanced and imaginative meals and discuss food preferences with guests before arrival. Muffins -- sweet or savoury -- $2 ea. Packed lunches for river trips or picnics can be prepared for $10 per person, includes tea or coffee and our own homemade lemonade. We have a range of items available, some are always available such as jams, pickles, sauces etc, and there are others such as muesli, yoghurts, biscuits, cakes, meal items such dessert slices, ice-cream, pasta sauces, pesto, etc which are available if required. Email us for a separate price list. These traditional words embody the sentiments of all in our community. 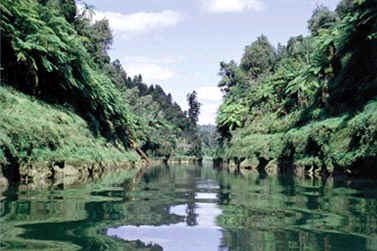 The Whanganui River is historically of deep spiritual and cultural significance to Whanganui iwi, Te Atihaunui o Paparangi, who are the tangata whenua, [Maori people of this area], and we respect and share their values. The river communities are small and we are involved in many initiatives to encourage the development of small business opportunities to enable growth in a sustainable manner. The health of our river is of paramount importance to us all and the legacy of former generations is being turned around by riparian plantings and changes in traditional land use. As tourism operators we are active members of ‘Journeys on the Whanganui’ which is the combined marketing brand of the Whanganui Maori Regional Tourism Organisation and the tourism operators working on and alongside the river. At The Flying Fox we endeavour to minimise our impact on our surroundings and are committed to the concept of environmentally responsible use of resources. 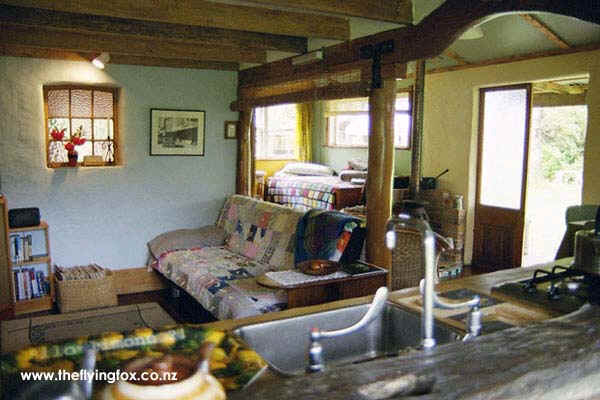 Our home and guest cottages are built using recycled and natural materials sourced from our area, we have developed grey-water systems, avoid the use of detergent based cleaning products, and reduce, reuse and recycle waste products using traditional kiwi ingenuity to develop a variety of practical solutions. 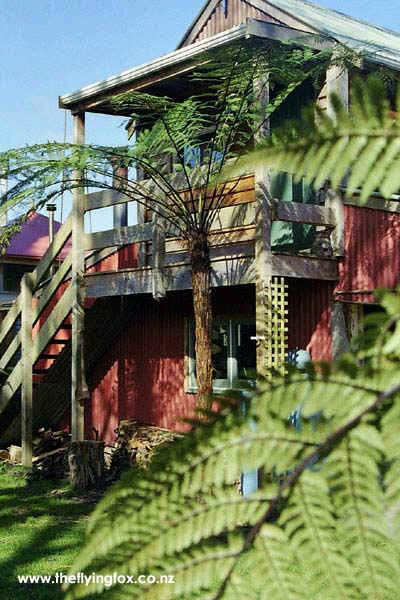 The area is surrounded by The Whanganui National Park, and our own native bush, avocado orchards, walnut trees, and organic gardens. We are involved in a project to preserve the original fruit and vegetable varieties of our historic valley, and use these to produce a range of organic pickles and preserves. These are available for sale at our place and at The River Traders Market each Saturday in Wanganui City. We also sell other locally produced items, organic supplies and the range of chemical free and environmentally friendly cleaning products we use at our place. location: River travellers will find us 500 metres downstream from the Marae at Koriniti, and there is a sign at our place on the right bank of the river. An easy track winds up to our garden and accommodation. If you are travelling by road from Whanganui take SH4 towards Mt Ruapehu, and take the second left [signposted Whanganui River Road ] after the village of Upokongaro , approx 12kms from Whanganui. We are almost 30km along this road, which should take approx 30 minutes to drive, it is a typical New Zealand backcountry road, and the 100kph speed limit should be more like 50 kph. Our place is on your left, watch for our sign and mailbox, and our rural number is 3081. From the north, take a right turn off SH4 at Raetihi, and follow the River Road to Pipiriki. Swing left at Pipiriki and continue down approx 35km. The road is unsealed most of the way from this direction, but you rejoin the seal around 7 or 8kms before our place. We are 2km past the sign at Koriniti. The gate will be latched but not locked, and although our gravel drive is steep and best suited to four-wheel drive vehicles when the weather is wet, other vehicles manage it with little difficulty. There is room to park near the cableway, or alternatively park at the top by our sign and walk down. If we are not in sight when you arrive, there is a whistle on the post by the cable car, which will attract our attention! Whanganui River Scenic Experience Tours is based on the Whanganui River Road at Pungarehu, 6.5 kms from the turnoff from SH4. They are well signposted and their driver Mark Wickham will meet you at their base at the prearranged time. The trip takes approximately 30 minutes and is a scenic journey through areas of National Park and hill-country farmland. Cable-car access is only practical for groups of six people or less, as only two can travel at one time, the alternative is to arrive by canoe or by river taxi. If you are arriving by road, and intend to come across by cable-car, timing needs to be prearranged as we are often away during the day. Please let us know in advance and also try to ring us before turning onto our road so that we know what time to watch for you, there is very little cell-phone access once you leave the main road. The cable car carries two people [or the equivalent of two adults and their bags] at a time and we operate it from our side of the river. All you need to do is get in with your gear, ensure the cable car is evenly balanced, then call out OK [very important as we don't start the motor until you call out!] when you are ready, then we will start your journey across. It takes about 3 minutes and is very sedate. Please stay seated until the cable-car stops moving.